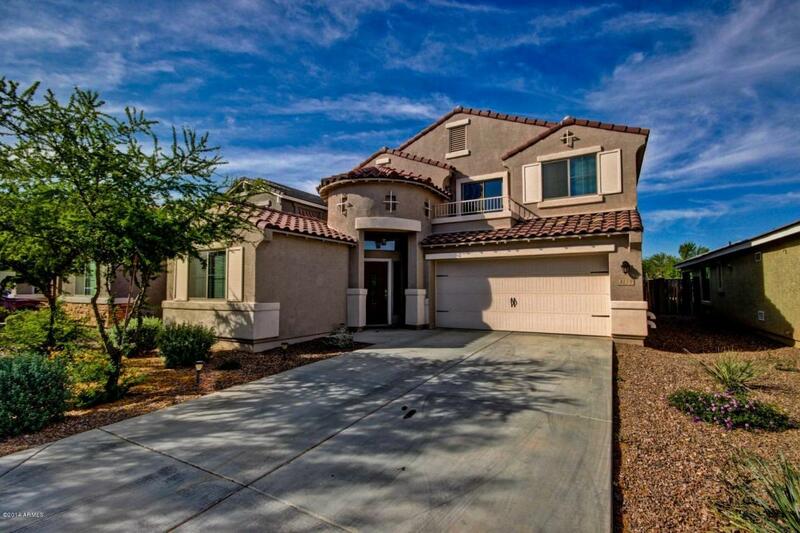 This beautiful Southwestern four bedroom, three bathroom home is ideal for any family that wants to live in Power Ranch. This home boasts a two car garage with a long drive way so there is room for all your cars and even a couple toys. Right off the entrance of the home you get a full guest bedroom and bathroom. Enjoy tile in the highly trafficked areas like, the front entrance, downstairs bathroom, kitchen, and living room! Although tile is great for the high traffic areas, you want carpet in all the right places. This home’s bedrooms and dinning room as well as the loft areas are carpeted softening the rooms and making them more cozy. The kitchen and living room have an open concept so you can enjoy cooking, while entertaining or being close to the family action. Having a family leads to messes. Enjoy easy clean up with the kitchen’s corian counter-tops! Not only are they heat resistant, but also anti micro-bile, and easy to clean! All appliances in the kitchen are stainless steel, and the stove is Gas. People prefer gas ovens and stoves because the temperature is more easily controlled. This kitchen’s cabinets bring out the beauty of the space and make the counters pop! Not only do you have these great amenities, but there is an island in the kitchen, and a full pantry as well! Kitchen islands are great for extra storage space and pantries helps keep you organized and helps to make it easier to find what you are looking for. The stairs are carpeted and have have custom steel and wood banisters that adds a look of elegant to the home. There is a loft upstairs that makes a great game room for the kids or another family room complete with comfy couches and a TV. 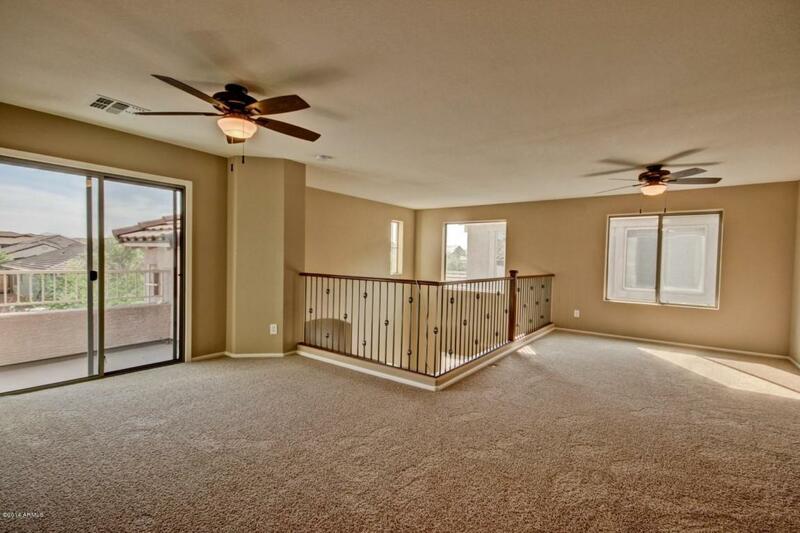 Right off the loft space there is a balcony great for opening and getting the great Arizona Spring or fall temperatures inside the home. Being a two story home, it would be frustrating to carry all the clothes up and down the stairs every time you need to do laundry. Easy solution is to have the laundry room upstairs! This home has an upstairs laundry making doing laundry more convenient. This home has a safety drain and basin the washing machine sits in just in case it overflows so it doesn’t flood your home! Adjacent to the laundry room are the two additional bedrooms and the master Suite. The master bedroom has double entry doors, a walk in closet and giant on-suite bathroom complete with double sinks and a separate shower and tub. The color of the cabinets in the master bathroom are the same color cabinets downstairs in the kitchen. To help keep the home cool during the summer months, each room has a ceiling fan installed in it; even the backyard patio has a fan! The backyard has a patch of grass so kids can do activities and for the dog to play on. The back yard has a wrought iron fence overlooking one of Power Ranch’s green belts, making the back yard look twice as big as it actually is! It also allows you to keep an eye on the kids while they play on the green belt. This home is a great place to start growing or keep growing your family! This home will retain it’s value and is the perfect place to start making long lasting memories your kids will think back on and remember all the good times they spent here.